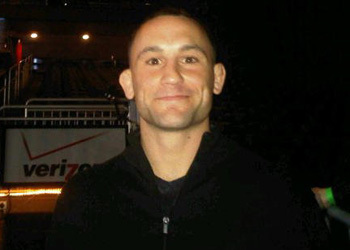 Frankie Edgar will be braking-in his lightweight title tomorrow night at UFC 118 against a familiar foe. After taking a hotly contested unanimous decision victory over former title holder BJ Penn at UFC 112 in April, Edgar will now have to prove he can make lightning strike twice. However, before he steps into the Octagon inside the TD Garden in Boston, the unassuming champ sat down with 5thround.com for an exclusive one-on-one interview. Tom Ngo: Prior to UFC 112, probably the only thing Americans knew about Toms River, New Jersey – where you’re from – was the 1998 Little League World Series team that won it all. How does it feel to steal the spotlight from those little kids and emerge as the toast of the town? Frankie Edgar: (Laughter) It’s great. Not many people know about Tom’s River, but we’re proud people where we come from. It’s good to represent for TR. Tom Ngo: You were fairly well known before beating BJ, but really got introduced to the mainstream world on MTV’s “True Life” a couple of years ago. Can you compare how your life has changed since that time? Frankie Edgar: Pretty much, training’s the same. I train a lot. I have a better team around me this time, though. Obviously, Ricardo Almeida and the Renzo Gracie team. I’m more experienced. I’m married and I have two kids, that’s probably the biggest difference for me. Tom Ngo: What’s tougher, having to prepare for your mulligan with Penn or chasing after two youngsters? Frankie Edgar: Watching two kids, dude. It’s no joke, man. From [having] one [boy] to two, it’s definitely a big jump in responsibility. Training is easy compared to that, but I enjoy it. I enjoy being a father and it’s definitely a turn for the better. Tom Ngo: If one day your kids come to you and ask to take over the family business, is that the day that you say ‘no’ because you’ve already gone down that violent road so they don’t have to, or would you immediately take them down to the gym yourself? Frankie Edgar: If they want to, I’m all for it. I think this is a sport just like any other sport and if I was a Major League Baseball player and my kid wanted to play baseball, of course I’d be for it. It’s not like I’m fighting to see myself, you know? If I didn’t fight, I’d probably be doing something else. If they want to take part in competing and fighting for a living, that’d be cool, man. It’s up to them. Tom Ngo: Surely a lot has changed in your life since UFC 112, but what’s the single coolest thing about being the Octagon lightweight champion? Frankie Edgar: Just to be recognized as number one, man. I think that any competitor’s main goal is to be the best, and to have that belt around your waist, I guess that signifies that you are the best. Tom Ngo: Speaking of donning UFC gold, does that make you the planet’s top 155-pounder? Frankie Edgar: I mean, of course I’d like to think of myself as the best but it is about match-ups. Sometimes it comes down to that night, which guy’s going to be the best. 155-pounds is such a talent-rich division, not only in the UFC but worldwide. Do I consider myself number one? In my head, yeah I do, but there’s always that talk about who’s better, which organization’s champion is better. The UFC has the most clout, though. Tom Ngo: Looking back 10 years from now, are you going to be more satisfied that you became a UFC champion or that you took down Penn when he was on top while in his prime? Frankie Edgar: I think they kind of go hand-in-hand. It’s tough to say which one’s better. I think the fact of how I got the title, beating the guy that’s considered the best lightweight ever, I think that’s probably the biggest accomplishment. Tom Ngo: How many times have you replayed the fight? Frankie Edgar: Honestly, I really only watched it once and then I’ve been watching it here and there with my boxing coach and my teammates – just for studying for this next fight. I really don’t gloat in the glory, in other words, cause you’re only as good as your last fight. Tom Ngo: BJ gets a lot of props for his speed and agility, but you seemed to consistently beat him to the punch for much of the first contest. Were you surprised that you were that much quicker? Frankie Edgar: Yeah, I guess you could say it surprised me a little bit. I knew he was fast, he’s still very fast. I don’t know if I’m faster or just better timing or what. I hope to have a repeat performance in that aspect. Tom Ngo: Shortly after your last outing, BJ’s coach Rudy Valentino claimed his client suffered a sinus infection and was on antibiotics leading up to the fight. Do you think them leaking that info was an attempt to diminish your win? Frankie Edgar: Nah, man. For me, he could’ve said anything. I would still have a smile from ear-to-ear, so nothing’s going to take that away from me. I worked hard for it. I felt like I earned it, so it doesn’t matter to me. Tom Ngo: You were a 5-to-1 underdog in the first fight and the Gambling Gods have somewhat jumped on your bandwagon because you’re ONLY a 2.5-to-1 ‘dog in the rematch. Does that mean if you win this time, you would finally be favored in a third bout? Frankie Edgar: I guess so (laughs). With the odds going like that, I guess that’s how it’ll work out, but hopefully this is it. Hopefully there’s no number three. Tom Ngo: You’ve stated that BJ, if anyone, deserves an immediate rematch. If he edges out a decision, do you think that justifies an immediate trilogy? Frankie Edgar: I don’t know. It’s up to the UFC brass, I guess you could say. Would it make for a pretty epic third fight? Yeah, I’m sure it would, but it all depends on how this fight goes on [Saturday]. Tom Ngo: If you were BJ watching and reviewing the game film from the last scrap, what would you change? Frankie Edgar: I think he’s going to try and cut the ring off. He’s probably going to try to maybe go for a little more takedowns and utilize his tools more. Obviously, I’m going to try to do stuff to prevent that from happening. Tom Ngo: They always say it’s easier to win the title than to defend it. Without going into game plans and such, what – if anything – has changed in your preparation or mindset for the do over? Frankie Edgar: Just my confidence. I always believed in myself before, but you still don’t know if it’s a definite thing. Now I know I can compete at that level. So I feel like this camp has been my biggest camp, I made the best improvements I have in my career. I think that has to do with the fact that I know I can compete at that level. Tom Ngo: MMA fans are saying that you shocked the world once already. Why are people going to believe this is going to be any different than GSP/Serra 2? Frankie Edgar: I don’t know, man. We fought a 5Round decision, you know? It wasn’t like I caught BJ with a punch or a submission or anything like that. Who knows? It could be, man. It could be. Maybe [beating BJ] was a fluke, but I don’t think it was. Tom Ngo: Thank you for your time. We’d like to give you an opportunity to give a shout-out to your supporters. Frankie Edgar: Yeah, thanks to the fans. Make sure you tune in [Saturday]. Thanks to you guys, 5thRound. My sponsor, Affliction, my team and my management. Thanks for all your support.